Iwagumi Padang, my planted tank before kids. Yes, that is a carbon dioxide canister pumping CO2 underwater! "Hemianthus callitrichoides, sometimes known as ‘dwarf baby tears’, or more commonly as ‘HC’, was discovered by Tropica founder Holger Windeløv during an expedition to a small rocky stream east of Havana, Cuba; it was described in aquaristic literature for the first time in 2003. Since its introduction into the hobby, HC has become increasingly popular and a foreground plant of choice, making this once rare plant moderately easy to obtain." - Aquatic Plant Central. 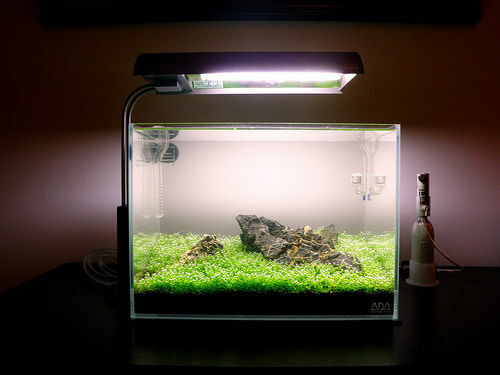 I was first introduced to the world of aquascaping and Iwagumi through Takashi Amano. I find the field quite inspiring and complex. One of the first few aquatic plants I fell in love with were HC. As an initiate, I found that while there were a number of reading resources on HC available, they were not aggregated into a single coherent and comprehensive guide for these delicate beauties. This report is intended as a reference guide for anyone seeking to successfully replicate and cultivate a beautiful dense carpet of HC underwater. 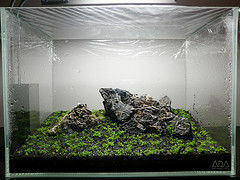 Emersed (Dry Start) or Submersed? I first housed my intended scape in a tank and a good light source. 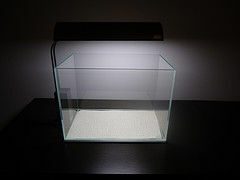 I have a 20 liter (5.5 gallon) rimless tank with a 27W, 8000K power compact fluorescent bulb. This works very well for a tank of this size and is sufficient for HC. HC demands a substantial amount of light as it is a tropical plant, so I tried to replicate its natural habitat for it to flourish. If you have to ask "do I have enough light?" - you probably don’t. At the very least, you should follow the two watts per gallon rule. It does not hurt to have more light. I used an 8000K lamp, which has the same spectrum as daylight. There are three layers to the substrate scape. First, I layered the bottom with ADA’s Powersand Special which is basically a fertilizer type substrate with additional nutrients and beneficial microorganisms. Next, I add a layer (at least 4cm depth) of ADA Amazonia 1, Normal Type. This is the main substrate. I prefer this over Amazonia 2 (ADA has recently updated the composition) as it does not crumble easily once flooded and has a more desirable chemistry (less acidic) with my source of freshwater. Finally, I topped it off with Amazonia 1, Powder Type. The powder type has finer granularity which is much more suitable for HCs rooting. I then added my hardscape. This included my choice of Seiryu stones. 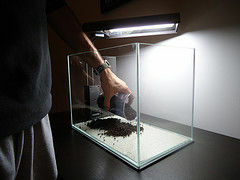 Once happy with my scape, I sprinkled a little more Amazonia Powder soil to cover any gaps and to make the hardscape seamless with the substrate (i.e. makes it look more natural). This was the "fun" part. It will take time and patience to delicately plant your HC carpet. I ended up with a sore back at the end of the process. How many pots of HC do I need? I found that most aquatic plant suppliers will sell you HC in pots of rock wool. I started with about six or seven pots for a tank of this size. The more you have to start with, the faster it will carpet. I kept the pots in a humid ziplock back as I worked through planting. 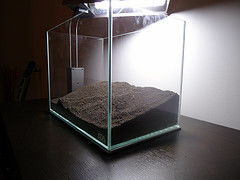 Do I need to remove rock wool or can I just plant HC with it? I removed it. It is a little extra work, but I found that as time goes by, I did not have to deal with excess dirt, rot, etc. and got better results. I started by cutting off the excess rock wool at the very bottom with a sharp scissors. Next, I used tweezers to separate out the HC into smaller clumps or stems. 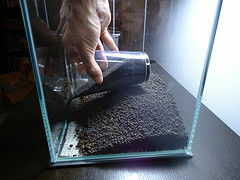 I wet the substrate so that it was uniformly moist as I did not want to work with a dry substrate. I was careful to not let any puddles or flooding to occur. I used a mister and spray over the scape a few times. Next, I individually planted these clumps/stems with a tweezer. Tweezers made it a lot easier, one’s fingers / hands are never small enough. When planting, I allowed about 5mm to 10mm of spacing between the clumps/stems. HC are no different than people as they need space to grow and flourish. As the HC are from the tropics, they require high humidity when grown emersed. To control for this, I got a clear saran wrap and covered the top of the tank. This kept the humidity high and heat within bounds after a day’s worth of lighting. I was then done with the initial set up of the HC’s environment. I set my lights on a timer for 8-10 hours a day. If the hardscape appeared dry, it is an indication of insufficient humidity – I would mist more and check that my saran wrap is sealed is tight! How Long Before I Get My Carpet? Patience is key. The longer I waited, the more the HC established itself. It took about a month before I saw a dense carpet. I was not concerned that I did not notice any progress the first couple of weeks. I placed faith and trust in mother nature. I refilled water in my mister with overnight tap-water. This reduced chlorine traces. I usually use water from my refrigerator’s filter. Alternatively, I preferred Brita-filtered tap-water to unfiltered tap-water. HC will suffocate if I do not leave a small gap in the saran wrap seal. On the contrary, my HC did dry out over time and perish when I left a small gap in the saran wrap seal in one of my first experiments and has this surprisingly affected me emotionally. My subsequent trials proved that the seal does need to be tight and that air flows in when you execute the daily misting in the mornings, sufficient to sustain growth and life until the next morning. Is it okay to miss a day of the daily routine? They are plants after all and plants have slow reaction times. I found that HC will perish from neglect as they are extremely sensitive and delicate. I learnt to treat them with respect very early on. The soil seems a little flooded. It took me awhile to practice a balanced level of daily misting. Excessive water will cause mold/algae to grow in the cumulated pools of water. This creates difficulty for HC growth in establishing roots and new stems. I used a syringe to extract excess cumulated water. I thank Jordan Alexiev and Kimberly Phillips for assistance throughout my experiments. I have also learnt a lot from discussions with members of the PlantedTank forums. I am in no way affiliated with ADA.